I’m not a gearhead, nor would I ever be mistaken for one. But this past February, I went to a monster truck rally with my wife and 3-year-old son Michael. We all loved it. A lot. Thanks to fatherhood, Michael’s interests have become my interests. Once upon a time, my likes and dislikes were my own. But now, with less time to myself, watching my son enjoy his hobbies constitutes its own enjoyment. And cars—diecast metal cars, remote cars, car cartoons, car-decorated clothing, sports cars we pass on the highway—make him the happiest. One of his favorite toys is a car that he takes apart and reassembles with a toddler-sized screwdriver. He even has a book on how a combustion engine works; he doesn’t understand it when we read it to him, but he still asks us to read it. He’s intrigued by the intricacy of the mechanism, and he traces his fingers over the different diagrams. His fascination with monster trucks arose from his fondness for Pixar’s Cars franchise. Specifically, he loves a series of cartoon shorts called Mater’s Tall Tales, which originally aired on the Disney Channel in 2008. There are 11 of these shorts, each five minutes or less. 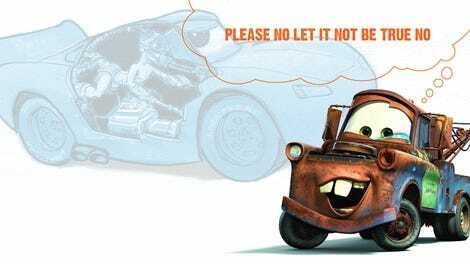 Mater, the Cars series’ well-meaning hayseed, is a Walter Mitty-esque character who imagines himself in different careers and different lives. In one short, he’s a rock star. In another, he’s a matador. In one of the longer cartoons, he’s a hardboiled detective in the vein of Humphrey Bogart’s Sam Spade. My son’s favorite Mater short is “Monster Truck Mater.” It casts Lightning McQueen and Mater as professional wrestlers who have to defend themselves against an increasingly large gauntlet of monster trucks. He asks to watch it over and over, and he yells “MONSTER TRUCK MATER!” whenever the characters appear on the screen. Seeing his interest, my wife Barbara researched and discovered that a monster truck event called Monster Jam would be taking place near our home in a month. We asked Michael if he wanted to see the monster trucks in person. Initially, he misunderstood; he thought we were asking if he wanted to see Mater and Lightning McQueen. But then we showed him clips of real monster trucks on YouTube, and he got the idea. One month later, the three of us were sitting in the Nassau Coliseum. Monster Jam frames itself as a sports competition in which the drivers of larger-than-life trucks do battle. It’s physical, visceral and entertaining the same way professional wrestling is. Before going, I assumed that at least hobbyist knowledge of cars would be a prerequisite for enjoying monster trucks. But you don’t need to know Greco-Roman wrestling to love professional wrestling, and you don’t need to know a car’s inner workings to enjoy Monster Jam. The trucks at Monster Jam compete in different events: at my show, the drivers squared off in donut contests, freestyle stunt driving, races, and wheelies. Monster Jam claims to be unscripted, but it would be more accurate to describe it as sports entertainment rather than actual sport. The judging isn’t treated with anything approaching scrupulousness or regulation. Monster Jam often pulls judges from its audiences, and the monster trucks are graded on ambiguous criteria such as “wow factor.” There’s even an option to poll the audience in order to determine the final score. So unless you’re a devoted fan, the raw statistics of points, wins, and losses aren’t the point. Monster Jam relies on visual storytelling devices to provoke an audience member’s preference for one monster truck over another. There’s kid-centered, John Cena-esque monster trucks like Scooby Doo, which even has a wagging tail and a collar. Some of the cars have bells and whistles, like El Toro Loco, which snorts smoke out of its ‘nostrils.’ There’s Megalodon; its body is designed to look like a massive shark. Some monster trucks are more reality-based, like Soldier Fortune and his blacker, sleeker brother, Soldier Fortune Black Ops; both are decked in patriotic camouflage. And then there’s Grave Digger, the de facto face of Monster Jam. Grave Digger has an illustrious, lengthy history as the grizzled veteran of the circuit. If Scooby Doo is John Cena, then correspondingly Grave Digger is the Undertaker. The original Grave Digger, created in 1981, was built out of a 1957 Chevy panel van and outfitted with spare parts from a junkyard. Grave Digger’s morbid visual presentation has been a part of its mystique since 1985: Ecto-green flames on a black background gravestones, creepy skulls, and red headlights, which were originally taken from old school buses. Grave Digger is particularly well-known for its wrecks, most recently in 2017, when the truck landed upside-down after a failed backflip. So many sports and competitive events are based on knowing the human individuals—their rags-to-riches stories, their family histories, their hopes and dreams. Even in Nascar, another vehicular sport where the participants are hidden from view, the drivers, not the cars, are front and center. But in Monster Jam, the cars and their legacies are more meaningful than any single driver. The original Grave Digger driver and creator was Dennis Anderson, but he recently retired. 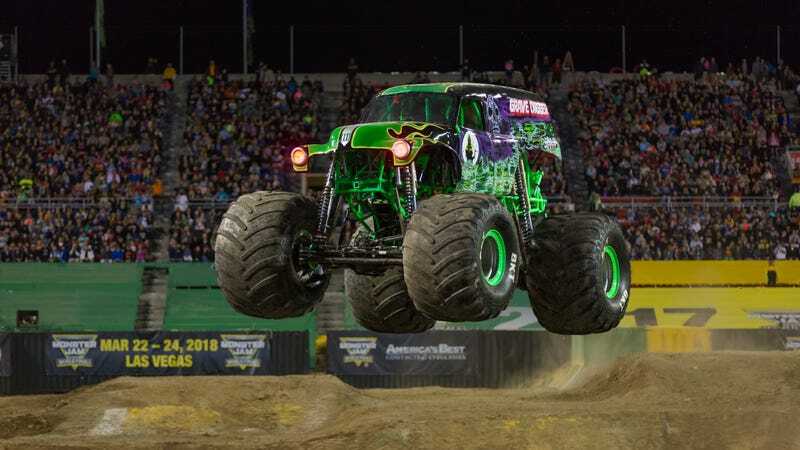 Even still, the truck is so popular that there are currently eight active Grave Digger drivers, who travel on different Monster Jam tours across the United States. They all represent the same character, and each of them drives a Grave Digger that looks similar to every other Grave Digger. There is an intentional sameness to all the Grave Diggers, because the character is bigger and more resonant than any single performer. Dennis Anderson trains all of the drivers on the Grave Digger team, ostensibly, to drive in the Grave Digger style. By doing so, he ensures narrative continuity and creates multiple access points for newcomers. I’m sure that a dedicated Monster Jam fan might follow individual drivers, prefer one driver’s technique to another, or see one particular driver as the “true” heir to Anderson’s legacy. But the average attendee would make no such distinction. It reminds me of Disney World, another project that specializes in escapist entertainment. There are multiple Mickey Mouse performers walking around the Magic Kingdom at any given time. And even though the tourists know this on some level, they suspend their disbelief and compartmentalize. They treat whichever Mickey Mouse they’re taking pictures with as the “real” Mickey Mouse; they wouldn’t for example, prefer the Mickey Mouse in Toontown to the Mickey Mouse waving in the afternoon parade. Disney even trains its Mickey Mouse performers to sign their autograph with the same bubbly lettering. There is an intentional sameness to all the Mickeys, because the character is bigger and more resonant than any single performer. At our show, Grave Digger crushed its competition. It had the best presentation and the most daring stunts—accelerating on two wheels, flying through the air with unreal hang time, and spinning so quickly that it kicked dirt into the front rows. At the end of its run, Grave Digger reared up on its back wheels in the center of the arena. Michael was overwhelmed—he knitted his brow and looked concerned during the actual event—but afterwards, Grave Digger was all he could talk about. Monster trucks are designed and expected to crash. Several times, they flipped over, and the audience responded with cheers. As a first-time viewer, seeing these massive monster trucks flip over was frightening; I worried if the driver inside was okay. After a while, however, I became desensitized to the bumps and took them for granted as a theatrical part of the show. Again, the trucks, not the drivers, became the focal point. Monster Jam is figuratively loud, and it’s also literally deafening. My wife and I had googled “first Monster Jam” the week prior, and multiple commenters advised wearing comprehensive ear protection at all times. We brought both protective earmuffs and earplugs, and we could still hear everything: the roar of the engines, the clanking of metal, the rock music played as entrance themes, and the emcee, who blared over the loudspeaker with the latest scores and announcements..
By the time we got home, Michael’s love for the Pixar Cars franchise had been superseded by his love for Monster Jam. He recounted his experience to his grandparents several times. We later bought him toy monster trucks, which he takes to bed with him instead of a teddy bear or other stuffed doll. Now he has a Monster Jam picture guide, which he loves to flip through and pore over. Perhaps after seeing real vehicles with character, Pixar’s cartoon cars—even ones that talk—no longer capture his imagination. Monster Jam’s non-verbal narrative of the epic, ongoing battle between Max-D, Zombie, and Grave Digger was more immediate and impactful. The best way for a newcomer to enjoy a monster truck rally is to think of these trucks as real characters—snarling, charging beasts with reinforced steel where their teeth should be. And unless the worst happens and Jason Torchinsky’s batshit homunculus theory comes true, this will be the closest we’ll ever get to having Cars characters in real life. What’s it like to be a monster truck driver?